Desperately need emergency plumbing in Doncaster and surrounds? Call H2-pro for fast emergency team of plumbers. Due to its complicated nature, there are a number of plumbing problems that can arise at any time in your home. At H2-Pro Plumbing, our phones are manned 24 hours a day and 365 days a year, providing you the support of a professional and industry-leading emergency plumber across Melbourne’s northeast. Do you need a 24-hour emergency plumber? At H2-Pro Plumbing, we’ve dealt with every possible problem needing emergency plumbing at all hours of the day and night. Oftentimes, panic takes over and we tend to lose our heads when faced with an unexpected or emergency situation. Thankfully, emergency plumbing is never far away when you call H2-Pro. First, check if you or anyone around you in is any immediate danger. If so, call Triple Zero (000). If you have determined there is no immediate danger but you still need an emergency plumber, call H2-Pro right now on 9844 1444. Is that gas I can smell? 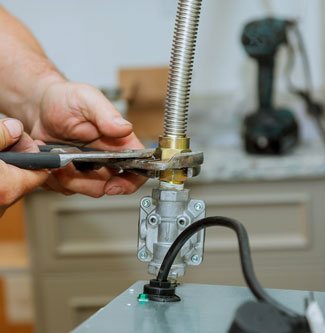 If you smell gas in your home, turn off all appliances and your pilot light, cut the supply of the gas meter, and open windows as a safety precaution. Do NOT, under any circumstances, try to identify a gas leak with a naked flame. Instead, call H2-Pro immediately on 9844 1444 – we’re licensed gas plumbers who can help identify and repair a gas leak. We’ll also undertake appropriate testing to ensure the leak has been resolved before relighting your appliances. Call our 24/7 plumbers Doncaster now! When you need an emergency plumber, you need a local plumbing company that responds promptly and can get to you without delay. H2-Pro’s unique approach means we focus on fewer suburbs, so we can always be there for a variety of domestic plumbing services and emergencies. Our H2-Pro Plumbing vans are fully stocked so we’re ready to reactively solve your emergency plumbing needs as soon as we arrive at your home. View more suburb profiles here. H2-Pro team now on 9844 1444!